The title of this post might be a bit optimistic - bees will be bees after all - but my focus this season is on keeping my honey bees from swarming. Magnificent as it might be to witness, the mass eruption of bees from a hive is not an event that endears one to one's neighbours. And when I am at home during daylight hours, especially between about one and four o'clock in the afternoon, I spend rather too much time looking anxiously out of the window, observing the density of bees in the air and fearing that they might be on the point of swarming off to pastures new. It would be bad enough if they simply streamed up into the air in a roaring cloud and high-tailed it away to make a new life in some remote apple orchard (goodbye nice queen, goodbye honey-making force), but what they tend to do is congregate en masse in a neighbour's garden, choosing some convenient location like the middle of the picnic table to hold a debate about where to make their new home, and generally make a spectacle of themselves. So, allow me to introduce a technological solution: the Snelgrove board! The idea of the Snelgrove method of swarm control is that you separate (i) the queen and the flying bees from (ii) the house bees and the brood, the theory being that neither of these two groups on its own will be prompted to further divide itself by swarming. You find the queen in the hive, transfer her on her brood frame into a new brood box, and fill up the rest of the box with empty frames. That new brood box is substituted for the old brood box on the hive stand. 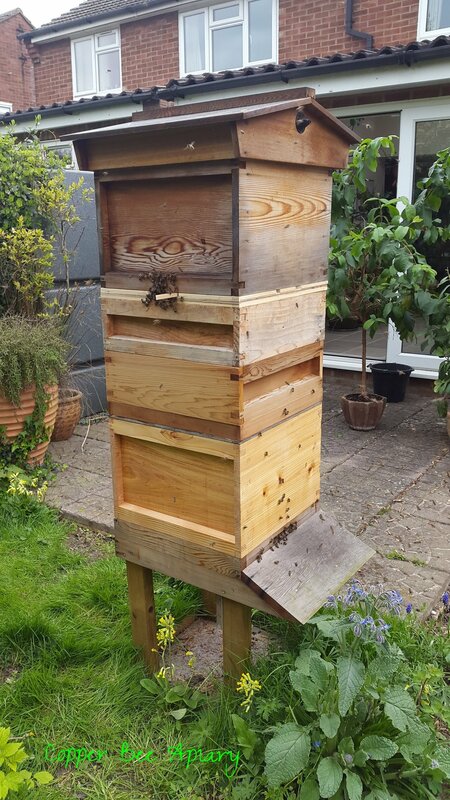 You then put the Snelgrove board on top of it, and the old brood box containing all the other bees on top of that. Bees cannot mix across the board, so you now have two separate colonies under one roof. You open one of the Snelgrove doors so that the top box has its own entrance. Now, the queen is in the bottom box (counting out her money), and the house bees and brood are in the top box (eating bread and honey). The flying bees are in the garden (hanging out the clothes), and they will come home to their original door and join the queen in the bottom box. 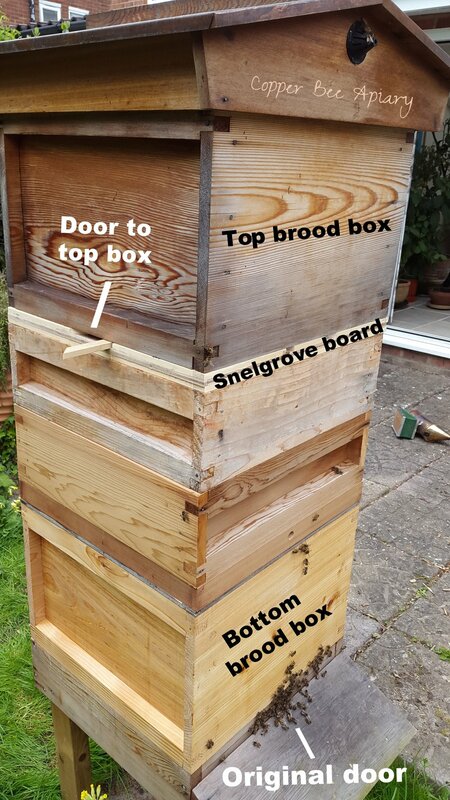 Other flying bees are in the top box and will fly out through the top door, but they are oriented to the original hive entrance, so they too will fly back to the bottom box on their return. You can imagine that the flying bees are deeply unimpressed with the situation they find on getting home. The lower colony has suffered a serious set-back with the removal of its brood and house bees. It must build up a new brood nest from scratch. Meanwhile the top colony will regain its composure a little more easily, raising a new queen and promoting house bees replace the flying bees that it lost. And that is where the cunning part of the Snelgrove method comes into play. 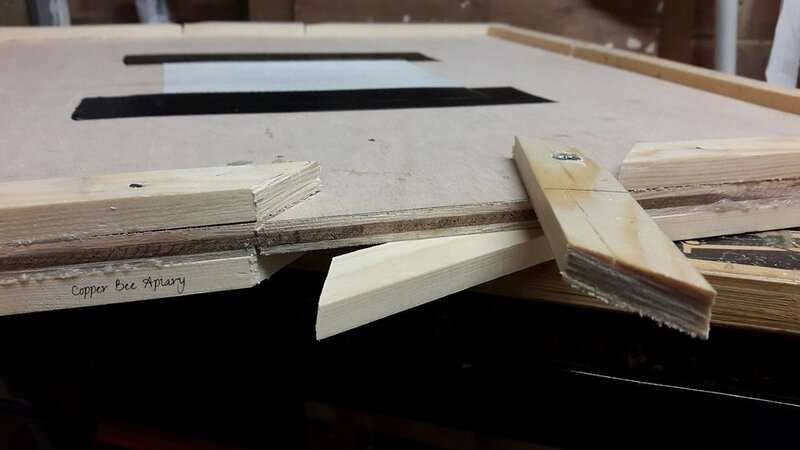 The doors in the Snelgrove board are paired. Each door to the top box has a corresponding door underneath it, which opens to the bottom box. You can close a top door and open its paired bottom door, which looks from the outside like the same door in the same place, but leads to the bottom box rather than the top box. 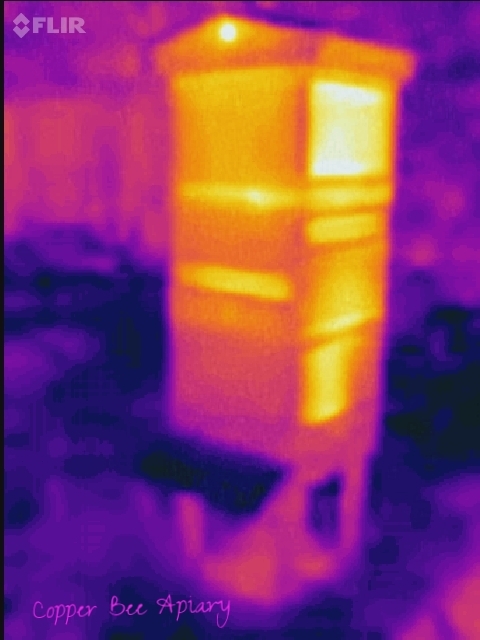 So, several days after the colony division, when the new batch of flying bees in the top box are busily coming and going from the top door, you switch doors. They return "home" and find themselves in the lower box. The mingling of hive scents across the mesh in the Snelgrove board supposedly helps with this trickery. You simultaneously open a top door on a different side to provide a new entrance to the top box. Newly promoted flying bees will start to orient to this door, and so you can repeat the process, repeatedly diverting flying bees from the top box to strengthen the lower colony and inhibit swarming of the top colony. Well, now that you know the theory, do you want to know what happened when I tried this with the Copper Hive? On Easter Monday I will do the first changing of the Snelgrove doors (don't tell the bees!). Ultimately, I don't know whether all these elaborate manipulations will prevent them from swarming, but it's worth a try.